Made by: Gray Telephone Pay Station Co. 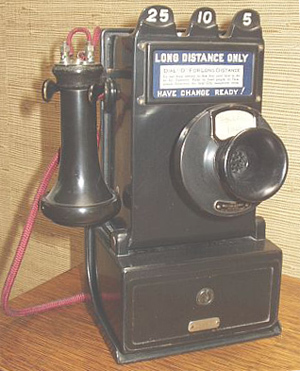 This is an early model coin telephone – a 'post-pay' model, which meant that the operator would make the connection for you and then ask you to deposit the coins. Note the 'outside terminals' (OST) on the receiver. For a good overview of early pay stations, see the 1912 Gray Telephone Pay Station catalog in the PDF library.